White House says Trump spoke with Netanyahu about the problems posed by Iran's "destabilizing activities”. 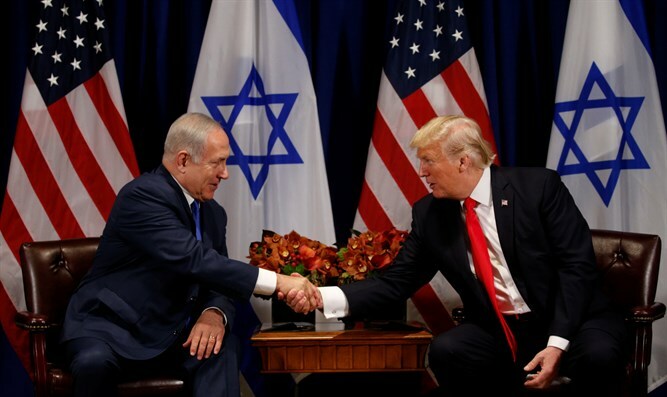 U.S. President Donald Trump spoke with Prime Minister Binyamin Netanyahu about concerns regarding Iran as the U.S. considers withdrawing from the Iran nuclear deal. The conversation took place on Saturday, according to The Hill. The two leaders discussed “threats and challenges facing the Middle East region, especially the problems posed by the Iranian regime’s destabilizing activities,” said a White House readout of the call released Sunday. Trump, who opposes the 2015 Iran nuclear deal signed under his predecessor, Barack Obama, has set a May 12 deadline for the deal’s European signatories to fix the flaws of the agreement and has threatened to withdraw if the deal is not fixed. Trump sees three main issues with the deal: several sunset provisions, the fact that inspectors cannot demand to see some military sites, and the fact it does not address Iran’s other activities, including its ballistic missile program and support for terrorist organizations. The president met this past week at the White House with French President Emmanuel Macron, who has been leading an effort by France, Britain and Germany to find those "fixes" to the deal that would satisfy Trump's objections. Trump and Netanyahu’s conversation took place a day before Secretary of State Mike Pompeo visited Israel. Pompeo, who met with Netanyahu on Sunday, vowed that the White House will reach an agreement to improve the deal, or else the U.S. will withdraw from the controversial agreement. On Friday, Pompeo said that Trump has not yet made a final decision on the matter but is “unlikely” to stay in the Iran nuclear deal unless it is substantially fixed.